I am very familiar with the city branch of Chef's Gallery, but had never visited the Macquarie Branch. I had suggested catching up with a friend here because it was conveniently located between where the two of us needed to be next, and hadn't intended to do a review at all. Then I saw what was on the dessert menu, and couldn't resist. Now, this might now be on all the Chef's Gallery menus, but I hadn't seen it before (admittedly it's been a while since I've been). Totoro garden - Kawaii! how cute is that?! Kawaii! Now, Chef's Gallery is a Chinese restaurant, but the Japanese have coined the perfect word to describe this dessert, so I'm appropriating it here. 'Kawaii' means super-duper cute, and is usually said with plenty of squee-ing and waving of fists in delight. And that's pretty much the reaction we had when this dessert came out. We arrived at 12pm on a week day, and it was fairly empty to begin with. The setup was comfortingly familiar - comfy booths, small tables for four scattered around, and the main glassed off kitchen area, so diners can watch the chefs at work, pulling noodles, squeezing together cute little dumplings - and everything scrupulously clean and wonderful. By 12.45pm, it was pretty crowded, with a little bit of a queue happening to get in. So evidently this branch is doing pretty well in this new location. We had some dumplings to start off with, which were beautifully plump and moist - and super delicious. So much so, we polished them off in all of half a minute, before I could say "wait! I should take a photo of that for my review!" The lamb roti were perfectly seasoned, with a hint of spice, crispy on the outside and fluffy on the inside. Again, we woofed these down without any hesitation. This was my friend's favourite dish. It wasn't actually on the menu because they had run out of the thin noodles that were picture in the noodle dish we ordered, so they substituted it with thick noodles, but whatever the case, the noodles were springy, fresh and slurptastic, with generous chunks of chicken throughout (also including the occasional hunk of skin, which while delicious, possibly wouldn't be so desirable for people watching their weight). The piggy buns are things I have had many a time at the city branch, and I love them for their cute exterior and delicious bitter-sweet black sesame interior. I thought I'd provide a picture of the inside so people know what the piggy bun looks like inside - it's hot, sweet, and oh, so delicious. I'm assuming the coconut marshmallows with the pointy heads and the bunny ears are meant to represent Totoro, that friendly over-sized Japanese cartoon cat which anime fans will be familiar with. It's not an overly obvious resemblance, but I'll give two thumbs up to the very cute depiction the whole plate conveyed. The people sitting next to us apologised as they leaned across us to ogle the dessert, and given how picturesque it was, I forgave them for this. In terms of deliciousness, the piggies and the totoros were lovely (I've always loved the piggies anyway, which have been a long-standing highlight of the Chef's Gallery menu). They're like pork buns, but with sweet black sesame paste inside instead of pork. The mango and strawberry icecream tasted fresh and of real fruit.The totoros were a coconut marshmallow flavour - yum. Everything else on the plate was more decorative than tasty. The little toasted golden white balls were meringue but more chalky in texture than the kind of meringues I favour, and the wafers which the little house was made of was fine, but liberally powdered in icing sugar which made it all a bit too sweet (pretty sure this was solely done for the " snow" visual effect). The carrot and parsley I'm pretty sure were there for colour as a garnish (they don't belong on a dessert plate otherwise). Top floor of the Macquarie Centre in North Ryde, next to Pappa Rich and just round the corner from the cinemas. Chef's gallery isn't the cheapest place for dumplings or noodles, but it's great for quality, efficiency and cleanliness. I actually found the service here to be much faster than in the city branch - but otherwise I'd say everything else is on par. For two people you would be looking at about $50 - $60 to share a few dishes together - a little more if you wanted to get Totoro's garden. 1) It's worth knowing that Chef's Gallery is currently in the Entertainment Book, so you'll get a 25% discount if you use your voucher (the Macquarie branch is so new I don't think it's listed on the voucher, but they were happy to accept it anyway). 2) It's also currently part of the Citibank Dining Program, which means that if you spend $50 or more and pay with your Citibank credit card, you are entitled to a free bottle of wine. 3) You can't use both of these offers together, so if you have both an Entertainment Book and a Citibank credit card, choose which one you want to make use of before you go. 4) If you are ordering the Totoro Garden, note that there is a 10-15 minute wait time from the time you order it. We actually ordered it at the same time as our main and it came out faster than we anticipated - be wary of this, because the ice cream means you probably shouldn't order it too early otherwise it will melt! 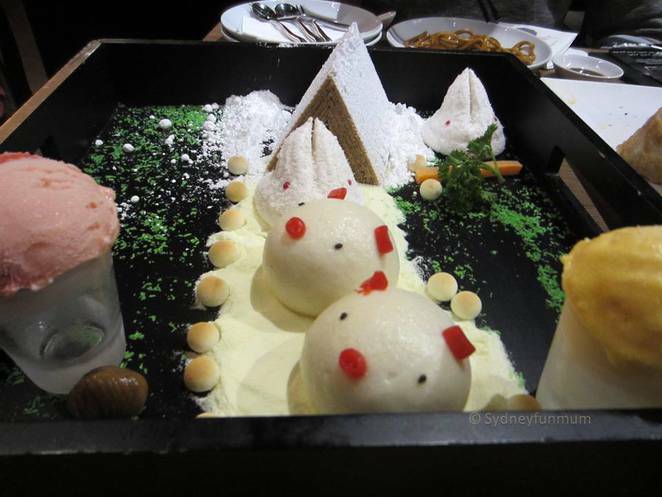 If you are wanting to impress someone with an amazingly cute and kawaii dessert, I'd definitely take them here. Cost: Allow about $35 per per person, depending on how much you eat! The food sounds amazing. I love the buns.